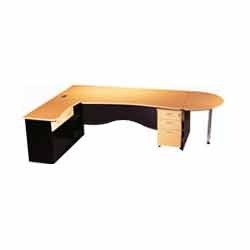 We are reckoned as one of the leading manufacturers and suppliers of a broad array of Office and Executive Tables that is normally fitted in a fluid line for providing a visual indication of the system condition. Besides, our experts make sure to examine the quality of the entire range before delivering these products to the clients. 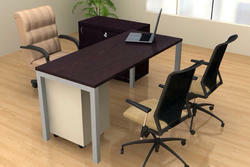 Executive Table Set (1800 x 900 x 750mm).Elegant design for High End Executive. Sizes can customized. 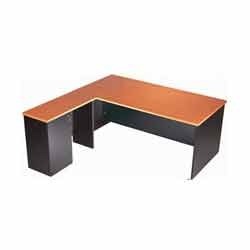 Sleek and Elegant looking Office Table having Powder Coated Pipe frame with 25mm Pre Lam Particle Board Top (Size: 1500x750x750) Side Unit with sliding doors(900x400x750). 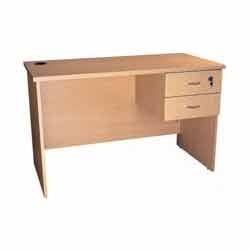 Mobile Pedestal having three drawers. Elegant looking Table set having Post Forming Tops in 25mm thickness. Doors and Facia in post forming in 18mm thickness. Main Table : 1800 x 900 x 750mm. Side Unit : 900 x 450 x 700mm. Drawer Pedestal : 400 x 450 x 700mm. 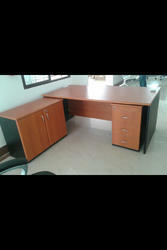 Modern Office Table Set in Pre Lam Particle Board. Main Table (1500 x 750 x 750mm). Side Unit (900 x 400 x 750mm). Fixed Pedestal (400 x 600 x 650mm). 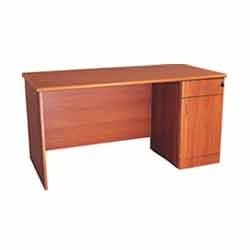 Director Table having Top & Sides in 36mm thickness and Modesty in 18mm with Side Unit having two numbers of three drawer pedestals. Main Table : 2400 x 900 x 750mm. Side Unit : 1350 x 450 x 750mm. 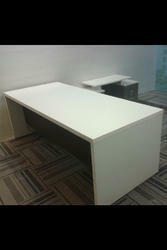 Executive Table 45mm thick panel based sides , 25mm Thk. pre lam board Top and 18mm Thk. 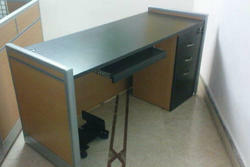 modesty with an attached three drawer pedestal and keyboard. 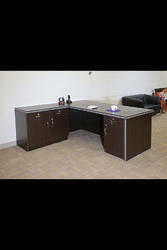 Cabin Furniture Set for Modern Offices. Suitable for a Room size of 10' x 8'. Main Table : 1500 x 750 x 750mm. Side Unit : 900 x 400 x 750mm. Back Ground Storages : 2400x400x750mm. Overhead Storages : 2400 x 400 x 600mm. 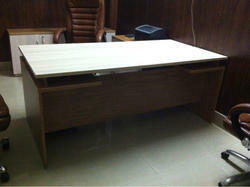 Executive Table set (1800 x 900 x750mm). 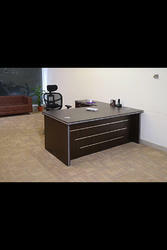 We are offering Office Table with Attached Drawer Pedestal. 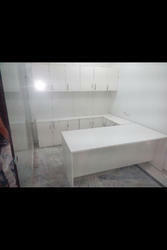 These are fabricated by our team of experts using latest technology. 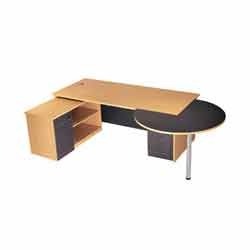 Modular Office Table in pre-laminated particle board with PVC edge banding tape attached with a drawer pedestal having one stationery drawer and one filing compartment with door. 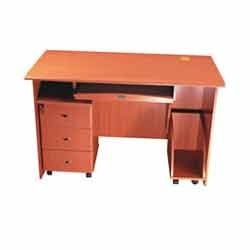 These Office Table with Attached Drawer Pedestal can be availed by our clients at market leading prices. Size (Feet) 1200 x 600mm. 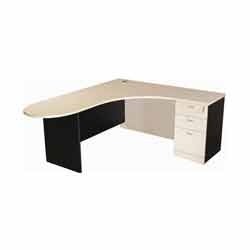 Sleek & Elegant Open Plan Work Desk with Magnetic Pin Board Screen. Main Table : 1200 x 600mm. Magnetic Screen : 900 x 300 x 18mm Thk. Side Unit : 900 x 400 x 750mm. 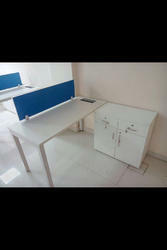 Looking for Office and Executive Tables ?